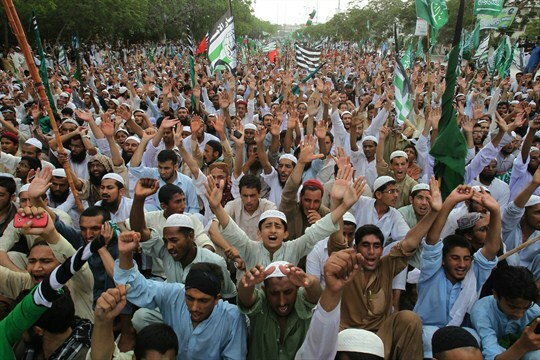 A rally organized in support of Saudi Arabia after lawmakers voted to support Riyadh in case of any threat to its territorial integrity, Karachi, Pakistan, May 8, 2015 (AP photo by Fareed Khan). LAHORE, Pakistan—When Muhammad Afzal awoke one August morning to go to his job at a textile mill in the industrial city of Faisalabad, he expected the day to unfold much like any other. But while he was at work on the factory floor, a man named Mohammad Shah approached him with an unexpected offer: How would he like to travel to Saudi Arabia?